It’s that time of year again folks! 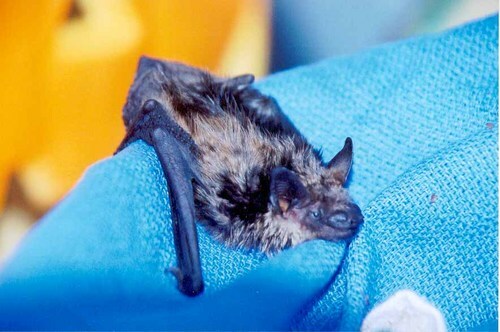 The baby big brown bats that often roost in attics and eaves of our homes are learning to fly! They will often follow a stream of light from inside your home at night, thinking that it is daylight and it is the way to get outside to catch bugs. If you don’t enjoy bats flying around inside your home like I do, buy a tube of caulk and go over any cracks where walls meet ceilings, chimneys, window and door jams. Take duct tape and go entirely around wherever the door is that goes into your attic space. Stuff insulation material in larger spaces, such as where the stove pipe goes up through the house. Remember, bats follow streams of LIGHT to find daylight and outdoors at dusk, so the object is to seal off cracks in your living space where light from a TV, nightlight etc might stream into where they are roosting, fooling the youngsters into thinking it is the way outside. If a bat does get into your house, don’t panic. grab a bath-sized towel and gently toss it over the bat and gather it up and take it outside. Bats are very delicate, like hummingbirds! The NYS Health Department might want to test a bat that has been in your sleeping area while you were sleeping, so you might contact them first if you are concerned.